Since the rise and fall of the militant Islamist movement in Somalia, an array of actors have intervened in Somalia with disparate aims and implications in terms of the post-transition period (August 2012 up to the present). Both regional states (Ethiopia and Kenya) and organizations (IGAD and AU) have contributed to the international re-engagement with Somalia, the most notable being the Africa Union Mission for Somalia (AMISOM since 2007). Al-shabaab, among other insurgent movements, continues to forcefully resist external-led interventions aimed at rebuilding the Somali state. Outside the region, the European Union has been particularly involved in providing support to state-building efforts with a focus on the security sector, especially the maritime dimension of security (through EUNAVFOR ATALANTA and EUCAP Nestor since July 2012) and the creation of security forces (through EUTM Somalia). This paper contributes to the debate on the interplay between insurgency, externally led state-building efforts and the particular domestic dynamics and how these contribute to or undermine the state reconstruction process. 1Since 1991 Somalia has been the site of internationally sponsored political engineering. The current government has signalled the end of the 8-year transition period since August 2012. However, in order to survive, it stills depends on external protection from the African Union Mission in Somalia (AMISOM), and its leadership at the time of writing still faces the challenge of bringing the al-shabaab led insurgency to an end. 2The central concern of this chapter is understanding to what extent the post-transition government will be able to rebuild state institutions in order to bring peace and prosperity to significant parts of the country. This chapter argues that the institutional architecture of the post-transition state resembles a state by and of international design. To date, key institutions in the judiciary and security have yet to be implemented. Moreover, the self-governing units in Somalia still need to agreed on the recognition of Federal Member States and the critical issue of the decision-making process around the creation of new Federal Member States. 3The overall aim of this article is to contribute to an understanding of key difficulties faced by external state creation projects in Africa. 4The central research question is to what extent the post-transition government represents another external state creation project in Somalia. To what extent the difficulties encountered are related to the general external state creation project in Africa, to post-conflict societies’ dynamics or to the particular trajectory of Somalia. This chapter seeks to understand the extent to which the past state creation projects are related to the recurrence of conflict in Somalia and to what extent the current attempt addresses the past obstacles to state reconstruction in Somalia. 5The period of analysis is 2006 to 2013. The starting year is 2006 and not 2004 or 1977 or 1884. 2004 was when the Transition Federal Government (TFG) was created in the Mbaghati peace process (2002-2004). The TFG was the outcome of the 14th external attempt to rebuild the state in Somalia. Kenya led the Somalia National Reconciliation Conference, which resulted in the creation of the TFG. 1977 was the year when Siyad Barre’s Somalia started a war with Haile Mariam Mengistu’s Ethiopia over Region V or the Ogaden region in Ethiopia, where a majority of citizens of Somali origin lived. 1884 marked the partition of the Somali-speaking areas in the region among the colonial powers or the colonial period where some of the problems that led to state disintegration could be found (Kapteijns, 2001). 6The selection of 2006 as the beginning of the period for analysis is justified by the fact that the rise of the Islamic Courts Union (ICU), its ascendancy and control of the capital triggered the move of the TFG from Kenya to Somalia (Baidoa). In addition, the ICU’s ruling period showed that order, or a semblance of it, could be restored under the auspices of a domestic generated and led initiative (Samatar, 2006; Barnes and Hassan, 2007; Bradbury, 2009). In addition, Ethiopia’s intervention in Somalia in the aftermath of the invitation of the TFG, at the time headed by President Abdullahi Yussuf, marked a significant rupture in Somalia’s domestic dynamics and especially in the relations between state and society. Indeed, while it remained in Somalian territory (2006 to 2009), the Ethiopia National Defence Force (ENDF) contributed to an unprecedented level of resistance and triggered a radicalization of Somalia’s society that had been absent before that period (Menkhaus, 2007). This in turn contributed to a heightened capacity of the remnants of the ICU and the main insurgency movement, al-shabaab, to mobilize support among Somali youth and other marginalized groups seeking payment of a salary on a regular basis (Marchal, 2009). 7This chapter is divided into four parts. The first part examines the state’s trajectory and focuses on understanding its disintegration in the aftermath of the fall of Siyad Barre’s regime and successive failed attempts at rebuilding the state. Indeed, Somalia epitomizes the inherent difficulties of external state creation in Africa (Clapham, 2011:73). The second part looks at relations between state and society in order to understand the main lines of cleavage in the conflict’s dynamics. The third part examines the post-transition institutional architecture (since August 2012). Finally, it seeks to place the issue of external actors’ engagement and intervention in Somalia, specifically Somalia’s neighbouring states, within the broader context of restoring order and stability within the state reconstruction project. Ultimately, this chapter reflects on how to restore the basic human imperative of trust in a shattered society and the inherent difficulties that multiple actors face in the context of post-conflict societies when trying to rebuild the state. Ultimately, the political dispensation that is most suitable to address the key challenges of restoring order, peace and stability via the reconstruction of the state lies with Somalia’s domestic constituencies. 8In the 1960s, Botswana and Somalia were praised as the two most homogenous nation-states in Africa. However, whereas Botswana was able to overcome the divisive potential of pre-colonial and colonial identities, Somalia gradually bent to its centrifugal pull (Samatar, 1997: 704). In Somalia’s case, as this section will argue, ethnic homogeneity was superseded by segmentary lineages, ultimately leading to political fragmentation and civil war. This interpretation, however, needs to be qualified. As a single factor, ethnic and/or clan identities were neither the cause of national consolidation in Botswana’s case nor of political fragmentation and civil war in Somalia’s case (Samatar, 1997: 697). This point will be further developed in the next section which deals with the main lines of cleavage in Somalia’s society. In addition, beyond Somalia’s homogeneity, an analysis of other lines of cleavage, such as social-economic and regional lines, show that minority groups from the southern riverine and inter-river areas, Afmaay speakers, have been marginalised and under-represented within the state’s institutions, particularly in the national assemblies and legislatures of the 1960s and 1970s (Cassanelli, 2003: 17). Since the 1980s, conflict over the control of critical resources such as land, water and local power have intensified to the loss of the local residents of these areas in South Somalia. Indeed, the disintegration of the Somali state was more ruinous for southern riverine groups as their territory was and continues to be the scene of intense battles (Menkhaus, 2003:150). 9The founding leaders of the Organization of African Unity (OAU) endorsed the consensual agreement on the principle of respecting the inherited colonial borders as the basis of statehood. Somalia’s conception of statehood was at odds with this arrangement. At the founding session of the OAU in Addis Ababa, the Somali leadership expressed its opposition to the uti possidetis principle. Somalia’s conception of nationhood was not embedded in the borders inherited at the time of independence but rather on the idea of a Greater Somalia. This idea challenged the artificial division of Somali-speaking communities across the boundaries that the colonial powers and Ethiopia’s Emperor Menelik recognized in the nineteenth century. The Somali leadership aimed to create a Somali state which would bring together the Somali- speaking communities dispersed in Djibouti, the new Somali Federation (which united British Somaliland and Italian Somaliland), Ethiopia’s Ogaden and the Kenyan Northern District. The five- pointed star on the Somali flag corresponded to these territories. Indeed, the unification of the three remaining points in the flag became “[…] the main target of Somali foreign policy from 1960” (Woodward, 1996: 196). 10In 1967 Prime Minister Egal, a Northerner, agreed to suspend any irredentist claim to Kenya, Djibouti and Ethiopia. Such was the fervour of nationalism that the political class and the press accused President Egal of “selling out the Greater Somalia ideal” (Jacquin-Berdal, 2002: 165-66). 11Until the war with Ethiopia broke out in 1977 (lasting until 1978), Siyad Barre toned down any irredentist claims in order to guarantee international support from the Soviet Union and avoid isolation in the region. Barre's “scientific socialism” was based on the eradication of the forces of “clannism” by nationalism (Jacquin-Berdal, 2002: 168-69). During this period Barre successfully mobilised “sentiments of national solidarity […] which effectively embraced all the nation’s major clans” (Lewis, 2002: 260-61). Indeed, one of the core tenets of Barre’s political programme for Somalia was its official rejection of “clannism”. However, the regime’s continuous interference in Ethiopia’s domestic affairs, especially in the Ogaden, was related at a deeper level to Siyad Barre’s reliance on clan and sub-clan solidarity to sustain his hold over the power structures of the state. The construction of his inner power circle encompassed members from a triangle of a related clan (Darood). According to Lewis, the three Darood sub- clans were the Marehan, Ogaden and Dulbahante (Lewis, 1989: 574). The Ogaden sub- clan was that of the President’s mother’s brother. 12The 1977-78 war had generated “a tremendous patriotic euphoria and Siyad Barre was the national hero for the duration of the war” (Samatar, 1997: 703; Lewis, 1989: 575). However, Somalia’s military defeat contributed to the regime’s decline. Shortly after the withdrawal of the troops from the Ogaden, dissident army units launched a coup against Barre’s government. The April 1978 coup had been both ill- timed and ill- planned. It was led by military officers of the Darood/ Majeerteen sub- clan (Mayall, 1978: 344). The military loyal to Barre reacted with the killing of civilians, mass abuses and the destruction of areas inhabited by the Majeerteen sub-clan (Elmi, 2010:18). In Ethiopia, this group of Majeerteen officers was involved in the creation of an insurgency movement, the Somalia Salvation and Democratic Front (SSDF) (Lewis, 1989: 575). Indeed, the government’s defeat contributed to the creation of the SSDF and the Somali National Movement (SNM) in 1978 and 1981, respectively. These two northern- Somalia opposition movements organised their guerrilla operations from bases in Ethiopia (Lewis and Mayall, 1996: 104).While the SSDF relied on Darood/ Majeerteen solidarity, the SNM relied mainly on Isaaq solidarity. In the second case as well Barre’s regime responded with reprisals on civilians, specifically killings in Hargeisa and Bur’o (Elmi, 2010: 18). The movements’ mobilization of support around clan affiliation was the outcome of Barre’s divisive strategies and elite manipulation. According to Lewis, by the end of the 1980s the collapse of national solidarity had been accompanied of an unparalleled growth of inter-clan rivalry. Barre relied almost exclusively on the support of his immediate sub-clan, the Marehan (a segment of the Darood). 13In a dangerous strategy Barre manipulated clan connections and antagonisms, distributing arms and financial incentives to co-opt supporters. In this context of increasing rivalry and suspicion the configuration of inter-clan alliances kept changing (Compagnon, 1998: 73). 14After the ousting of the regime in 1991, the state succumbed to the centrifugal forces of segmentation within society and disintegrated. The various political factions manipulated clan and sub-clan rivalries to advance their claims to the spoils of the state. With the state's disintegration, economic rivalry between factions of the same clan/sub-clan also led to inter- clan alliances sometimes in “violation” of the segmentary kinship principle (Lewis, 2002: 260-61). Clan-based contradictions were a constituent element of the equation (Lewis, 2002: 52). 15Furthermore, the disintegration of the state created notable changes and the former Somali Republic split up into at least three “self- governing units” (Lewis, 2002: 333). Without a government at the helm, Somaliland unilaterally declared independence (1991) and Puntland established itself as an autonomous region (1998). The disintegration of the state further aggravated the pre-existing permeability of Somalia’s borders, rendering it vulnerable to incursions from neighbouring states. For contiguous neighbouring countries, namely Ethiopia and Kenya, the breakdown of the state, in part, froze challenges to their territorial integrity. The remnants of Somalia, i.e. the capital, central and southern Somalia, were ravaged by armed conflict between shifting factions. 16Between 1991 and 2012 international actors supported 15 attempts at forming a government and several conferences outside Somalia, five of which were major meetings, yielded temporary outcomes, though they all failed in the end. The interference from external actors (mainly neighbouring countries), the unwillingness of domestic actors to reconstruct the state and the reduced legitimacy and domestic support for internationally sponsored initiatives all worked against the ultimate goal of restoring order and stability and rebuilding the state. The initiatives included the Djibouti Conference in 1991, the Addis Ababa Conference on National Reconciliation in Ethiopia in 1993, the Cairo Conference in 1997, the Somalia National Peace Conference in Djibouti, known as the Arta peace process in 2000, which led to the creation of the Transitional National Government and the election of President Salad and the Somalia National Reconciliation Conference in Kenya, known as the Mbagathi peace process between 2002-2004, which led to the creation of the Transitional Federal Government and the election of President Yussuf (Elmi, 2010: 22; Bradbury, 2009: 7). The Mbagathi peace process’s political arrangements had to be revised in 2008 with the Djibouti political process and as a result the ICU’s moderate Islamist Sheik Sharif Ahmed was elected as the last President of the transition’s political dispensation. Finally, after the end of the transition period in August 2012, the Federal Parliament elected a new incumbent, President Mahmoud in September 2012. 17Any analysis that is anchored on a single-factor explanation fails to capture the complexity of state and society relations. This has been even more acute in Somalia’s case. 18Authors seem to diverge as to the importance of the Somali segmentary lineage system to an understanding of politics. Indeed, the divergent analyses of the role of clans in politics have had implications in terms of proposed state reconstruction projects in Somalia. 19Those that follow Lewis’s analysis of Somalia’s politics emphasize the key role of clans and sub-clans and their divisiveness and centrifugal pull over the centre as the key obstacle to rebuilding a national state (Lewis, 2002: viii). 20Despite rivalry between Darood and Hawiye, there is also intra-clan rivalry. The rivalry between Hawiye- Abgal and Hawiye- Habr- Gidir/ Ayr and even between Hawiye/ Habr- Gidir Sa’ad and Ayr in Mogadishu in 2006, or the rivalry between Darood Marehan and Darood Dulbahante in Kismayo over control of the city in 2013, have shown that at times conflict over control of critical resources supersedes alleged clan and sub-clan solidarity. Furthermore, conflict over control of critical resources has also proven to be disruptive of alliances built on the basis of religious solidarity, such as the rivalry and splintering of al-shabaab and Hizbul Islam in Kismayo over control of the port in 2009. 21Any analysis that takes the major clan families as the key referent will inevitably be undermined by the bewildering shifting of allegiances according to the level of segmental solidarity mobilized. In addition, inter-clan alliances also occur, sometimes in contradiction of the kinship principle. Traditionally, inter-clan alliances were forged via social contract and/or marriage. Since 1991 in particular, alliances have tended to shift according to political circumstances, economic interests and/or the faction leaders’ predatory agendas. The boundaries between kin groups move constantly and politics is defined as much by contract (heer) as by kinship (reer) (Compagnon, 1998: 73). 22Beyond clan and sub-clan affiliations, regional, socio-economic cleavages and gender are paramount to understanding fault lines in state and society’s relations in Somalia and to understanding the changing conflict dynamics (Little, 2003; Cassanelli, 2003; Menkhaus, 2004; Hagmann, 2005: 532). 24The conflict for territorial supremacy in 1991-92 in the riverine and inter-river areas destroyed critical resources, such as herds, grain stores and irrigation pumps. The warlords that have prevented the state from regaining the legitimate monopoly over the means of coercion are not simply clan leaders. The warlords are rivals using weapons, alliances and propaganda to gain access to productive land, port facilities and urban real estate (Cassanelli, 2003: 15). 25Gender cleavages pervaded Somalia’s state and society relations long before the disintegration of the state and brought together traditional and religious leaders. Those who respected both Customary and Islamic law in Somalia fiercely opposed Barre’s attempt to implement the 1975 Family Code, which would impact on inheritance issues. The law aimed at entitling women to inherit half of what their brothers inherited. The law was not implemented in the end (Helander, 1999: 48). Women have gradually become more involved in civil society and politics. In the internationally sponsored peace conferences and parliaments that have resulted from these internally-led initiatives, women were awarded a quota of the total seats. The first conference to establish a 25 per cent quota for women representatives in the future parliament was the Arta peace process. This measure was retained in the Mbagathi peace process but the quota was reduced to 12 per cent (Bradbury, 2009: 24). However, looking at members of the past and the current Federal Parliament the number of female members of parliament remains below the 12 per cent threshold. 26Religious solidarity with the ascendancy of the ICU and its control of the capital between June and December 2006 seemed to be the only viable alternative with regard to a political state building project. Indeed, solidarity around Islam during the ICU’s “ruling” period in the capital mobilized consensus among various sections of Somalia’s society, both within Somalia and in the diaspora (Samatar, 2006). Since the fall of Siyad Barre, the ICU’s short-lived rule was lauded by some as the most successful experiment at bringing order and stability to the capital and as having managed to control and re-establish order over large swathes of territory in south-central Somalia (Woodward, 2013: 88). The ICU rule was perceived as legitimate because it sought to answer local security concerns and it was committed to keeping public order and safety (Bradbury, 2009: 31). However, the ascendancy of more militant elements and factions within the ICU raised suspicions in the regional and global political arenas, especially in Addis Abeba and Washington. It should be noted that most Somalis, who profess Sunni Islam, viewed the salafi interpretation of Islam as an ideological import (ICG, 2005: 16) and were therefore not inclined to support the more militant, extremist leanings within ICU’s disparate leadership. 27As a result of different interpretations of the role of clans in politics, Somalis have been divided between those that favour a centralized unionist approach and those that favour a decentralized approach within a federal model (Menkhaus, 2008). The unitary approach is fiercely resisted because of fears of re-establishment of Siyad Barre’s style of governance based on clan dominance (Woodward, 2013: 87). Somalis believe that the unitary approach favours majority clans’ dominance. Indeed, as argued in the previous section, Barre maintained his grip on power through reliance on the MOD formula. Others oppose the intertwining of clans and politics, as they argue the clans are a form of social organization and clan politics reflect narrow political interests which are in tension with those of a democratic state. The system of proportional representation based on the 4,5 formula adopted originally at the 1996 Sodere Conference, afterwards at the 2000 Arta peace process and the 2002-2004 Mbagathi peace process, reproduces an imbalance between majority and minority clans and contradicts the democratic principle of equal representation of all citizens (Bradbury, 2009: 17). This formula, as will be developed further in the next section, awards an equal number of places to each of the four major Somali clan-families (Rahanweyn, Dir, Hawiye and Darood) with the remaining 0,5 allotted to minority groups and women. The disagreements over which federal model will be implemented in the post-transition period will be the subject of the next section. 28The underlying dilemma remains unanswered. 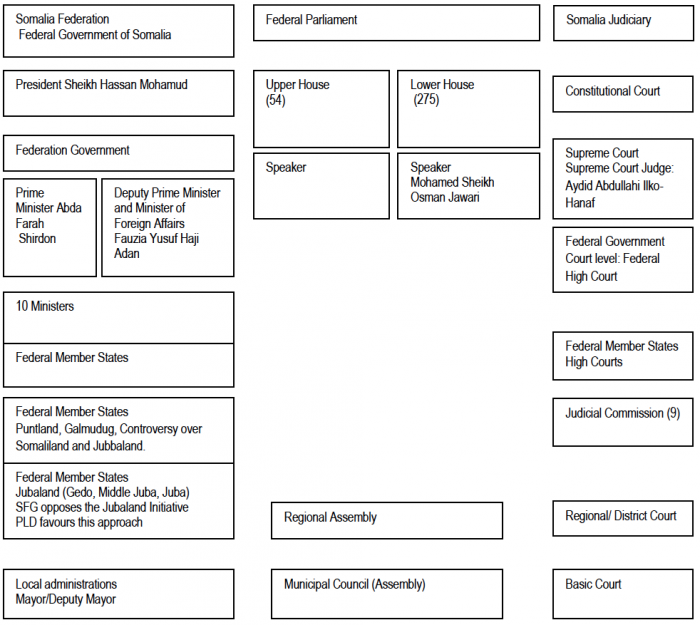 What kind of federal model will emerge in post-transition Somalia? More specifically what form of federalism will prevail? Puntland favours a decentralized form of federalism while the Federal Government of Somalia seems to favour a centralized approach to the creation of new Federal Member States. In a federal system of states what level of local autonomy will be recognized for each of the Federal Member States? Finally, what role will clan, sub-clans and minority groups play at local and regional level? Will minority groups be represented in local and regional councils? 29Since 2009 Sharia has been recognised as the main law of the country. However, the Provisional Constitution is not clear on the key elements of Shari’a Implementation, on the relationship between the sharia’s courts and other court judges and on the major legal domains that fall under sharia or Somalia’s post-transition judicial system. Not all parties seem to have accepted the post-transition institutional architecture, namely the judicial system. Indeed, al-shabaab in April 2013 attacked the main court house in Mogadishu as a sign of rejection of the post-transition institutional architecture (BBC, 2014). 30The controversy surrounding the federal model to be implemented starts with the key question of who can decide on the creation of new Federal Member States. According to the Provisional Federal Constitution, federal states can be established as long as they are based on “a voluntary decision, two or more regions may merge to form a Federal Member State” (e.g. Juba, Middle Juba and Gedo could unite to bring the Jubaland initiative into fruition). However, according to the Constitution, the lower house of the Federal Parliament and a National Commission (that was not yet set up at the time of writting) will need to decide on this matter. The current constitutional row over the creation of new Federal Member States and the Constitution’s lack of clarity further complicate the decision over who controls and leads this process. As Prime Minister Shirdon has argued the central government and parliament lead the creation of Federal Member States. In contrast, the regions themselves like Puntland and the leadership involved in setting up the Jubaland Federal state have argued that the regions should lead the creation of Federal Member States. 31As Figure 1 shows the executive, legislative and judiciary powers are intended to be distributed between the federal, Federal Member States and local level. Source: Designed by Alexandra M. Dias. Adapted from Bose (2012: 61). 32The tension between the central Federal Government, the Federal Member States and the local level is a key fault line that threatens to compromise the post-transition institutional architecture and the restoration and exercise of the executive, legislative and judicial powers. Furthermore, the Foreign Minister in Prime Minister’s Shirdon cabinet is originally from Somaliland. This should not be interpreted as a mere coincidence. Somaliland’s quest for international recognition is not likely to wane even with a functioning government in Mogadiscio. Puntland and Galmudug qualify and seem inclined to join the Federation. The Jubaland initiative, which aims at creating a new Federal Member State, is not a recent political project, though its re-emergence at a critical juncture has highlighted and re-opened the debate on the form of the Federation, the ambiguities and diverging conceptions over the decision-making process when it comes to the creation of Federal Member States and the degree of initiative and autonomy to be awarded to the region. Indeed, this is a major fault line in the state reconstruction project. 33This section addresses the region’s states' engagement in Somalia. The role of the UN and its agencies, the EU and EU member states, Turkey and the US will only be discussed as complementary. The key theoretical premise remains that the domestic and regional security dynamics are prominent in relation to other global dynamics. Indeed, although extra-regional actors and global dynamics do play an important role, this and the preceding sections show that both Somali (including diaspora formations) and regional actors are far more determinant for understanding Somalia’s state trajectory and conflict dynamics (Marchal, 2012: 2; Cliffe, 1999; Woodward, 2013: 46). Correspondingly, Somalia’s conflict remains pivotal to the Horn of Africa’s security. 34The UN, more specifically the United Nations Political Office for Somalia (UNPOS) via the United Nations Secretary General’s Special Representatives for Somalia, has played a critical role both in the process that led to the election of the last President of the Transitional Federal Government (President Sheikh Sharif Ahmed) in preparation of the post-transition period and in the institutional architecture and Provisional Constitution of Somalia. According to UNSC Resolution 2093 of 6 March 2013 and UNSC Resolution 2102 of 2 May 2013 (UNSC, 2013a; 2013b), the UNPOS is to be replaced by a successor mission by 3 June 2013 entitled United Nations Assistance Mission in Somalia (UNSOM). 35After the disintegration of the state and in face of the escalation of violence in 1991-92, the first UN peacekeeping operation in Somalia was empowered by UNSC Resolution 794 of 3 December 1992 (UNSC, 1992). The operation was named Operation Restore Hope. At the time the Resolution was greeted as a very significant opening as it was the first attempt to establish a humanitarian operation under Chapter VII. The US contribution was critical to setting up the operation. The US administration created the Unified Task Force (UNITAF) to act in coordination with the United Nations Mission for Somalia (UNOSOM). Despite considerable problems UNOSOM II took over formally from UNITAF/UNISOM on May 4, 1993. As the security situation deteriorated, UN and US forces reacted increasingly aggressively (Lewis and Mayall, 1996: 107- 124). This would culminate with the clash between Somali militia and US peacekeeping forces on 3-4 October 1993, which resulted in the loss of 18 American soldiers and the withdrawal of US forces in 1994. Engulfed with insurmountable difficulties the UNPKO withdrew from Somalia in March 1995. Quite significantly, on 24 February 2012, the UN flag was raised for the first time since the UN’s withdrawal in 1995. 36The regional organization, the Intergovernmental Authority on Development (IGAD) had been divided at the TFG’s request for an interposition force. Earlier plans to create an IGAD Peacekeeping operation for Somalia, IGASOM, failed due to a lack of consensus among its member states on the composition of the force. Sudan, Eritrea and Djibouti opposed contributions from contiguous neighbouring countries to Somalia at the time. 37The ICU and some members of the Transitional Federal Institutions (TFIs) had opposition to the deployment of foreign forces in Somalia as their common denominator. The United Nations Security Council authorised the African Union Mission in Somalia, AMISOM, under a Chapter VII Resolution (UNSC/RES/1744) on 20 February 2007 (UNSC, 2007). The African Union deployed the first contingent of peacekeepers in the capital on 6 March 2007. AMISOM at the time of writing is comprised of a total contingent of 5,432 Burundian, 960 Djiboutian, 4,652 Kenyan and 6,223 Ugandan peacekeepers. AMISOM uniformed personnel as of 10 April 2013 totals 15,155 (Opérations Paix Net, 2013). The United Nations Security Council Resolution 2093 of 6 March 2013 has authorised maintenance of current contributions up to a maximum of 17,731 uniformed personnel until 28 February 2014 (UNSC, 2013a). 38At the outset, civilians in Mogadishu were hostile to the presence of both Ethiopian troops and AMISOM peacekeepers. In addition, the disproportionate use of force by the warring parties placed civilians in the middle of hostilities inflicting major casualties on non- combatants (Human Rights Watch, 2007). This state of affairs at the time created resentment both of Ethiopia and of the TFG, as it revived the worst memories of the intense fighting between faction leaders in the early 1990s. The US air campaigns helped create resentment over US interference in Somalia’s domestic affairs and connected US and Ethiopia’s interventions in Somalia. 39After the ENDF’s withdrawal in January 2009, opposition to AMISOM started to wane. 40After the IGAD’s public recognition of Ethiopia’s sacrifice for regional peace in Somalia, Eritrea decided to temporarily suspend its membership (Sudan Tribune, 2007). Eritrea demanded to re-activate its membership four years later (Sudan Tribune, 2011). 41IGAD countries divergences vis-à-vis the Somali crisis had other implications. In addition to the Ethiopia-backed TFG offensive, Kenya closed its border with Somalia in order to prevent ICU members from escaping and mingling unnoticed with the Somali-speaking communities. Kenya handed one of the prime ‘terrorists’ in to the US, allegedly for his involvement in the Mombassa 2002 hotel bombing and his links with the al-Qaeda East Africa Network (Roberts, 2007). Finally, Kenya intervened forcefully in Somalia in October 2011 and has joined AMISOM (ICG, 2012) while Ethiopia has continued to opt for unilateral intervention close to its borders. 42International engagement in Somalia’s crisis has shown that the influence of IGAD tends to be by-passed by bilateral interstate relations and by the self-interested motivations of regional countries (Vines, 2012: 7). In addition, a shifting pattern of alliances has characterized the region, contributing to the reproduction and reinforcement of the motto “My enemy’s enemy is my friend”. Indeed, the constantly changing alignments compose the pattern of power within the Horn of Africa region (Bull and Holbraad, 1995: 157). In Somalia’s case this pattern was reproduced in Ethiopia and Eritrea’s diverging support strategies to the conflict protagonists back in 2006 (while Ethiopia supported President Yussuf’s TFG, Eritrea supported the ICU leadership). 43The limited scope and density of regional governance at the formal level of inter-state relations within the Horn of Africa region gives space for non-state actors to play a major role in determining the dynamics of regional security. Al-shabaab's continued ability to launch attacks outside Somalia’s territory since the 2010 attacks in Kampala during the closing match of the World Cup is a potent reminder of the interconnectedness of the region’s security dynamics. 44Djibouti, Ethiopia and Kenya host the widest proportion of refugees of Somali origin and count ethnic groups who identify with Somali clans among their national citizens. As discussed in the first section, at the time of African independences, the idea of Greater Somalia aimed to incorporate Somali-speaking areas in the Horn of Africa in a united Somali state. As a result, both Kenya and Ethiopia follow Somalia’s domestic politics closely and have long vied in influencing the various attempts at rebuilding the state. Since 2006 both Ethiopia and Kenya have been engaged, interfered and intervened forcefully in Somalia’s domestic politics. Some authors argue that their role has been critical in preventing the emergence of any viable government in Somalia (Marchal, 2012: 2). 45During the period under analysis (2006-2013) Somalia’s neighbouring states had to directly handle the ramifications of Somalia’s conflict and famine crisis in 2011 in terms of refugee flow. Indeed, this pattern confirms the overall trend in other regions. The main refugee flows are intra-regional and 86 per cent of refugees tend to remain within their region of origin and in contiguous neighbouring states (Hammerstad, 2010: 245; Bali, 2005: 178). 46Despite increased international engagement in Somalia, both from regional and extra-regional actors, the number of refugees originating from Somalia in neighbouring states has steadily increased and in the aftermath of the 2011 famine the number has passed the 1 million threshold. 47Figure 2 shows that between 2006 and 2013 Somali refugees in Djibouti, Ethiopia, Kenya and Yemen have grown exponentially. Source: UNHCR (2006, 2007, 2008, 2009, 2010, 2011, 2012, 2013). 48While in 2006 these states had 8,642; 16,576; 173,702 and 91,587 Somali refugees respectively, in the first four months of 2013 they had 18,725; 238,957; 507,797 and 229,447. The two contiguous neighbouring states, Ethiopia and Kenya, host the largest group of Somali refugees with 238,957 and 507,797. 49In addition, both Ethiopia’s and Kenya's pattern of interference in Somalia’s internal affairs and the military incursions into Somalia’s territory between 2006 and 2013 made the settlement of Somali refugees near the border even more problematic. This is nothing new, but the continuous placement of Somali refugee camps in borderland areas near their country of origin means that Somalis are not adequately protected from the conflict they fled from in the first place. Refugee camps close to the border of the refugees’ country of origin further increase insecurity (Lomo, 2006: 44-45). Al-shabaab has intensified its penetration and has launched attacks on Dadaab refugee camps located in Kenya 100 kilometres from Somalia (McSweeney, 2012). 50Between 2006 and 2013, neighbouring countries’ interventions in Somalia have led to the perpetration of human rights’ violations against Somali citizens, refugees and those of Somali origins. More specifically, Ethiopia, Kenya and other parties to the conflict (the previous TFG security forces and AMISOM) have been accused of committing abuses against civilians in Somalia (Human Rights Watch, 2007; 2008; 2012; 2013). Ethiopia, between 2006 and 2009 and thereafter through its incursions into Somali territory near the border, and Kenya since 2011, firstly with Operation Linda Nchi (Protect the Country) and then as a troop contributing country to AMISOM, have both perpetrated human rights abuses against Somalis inside Somalia. 52While al-shabaab is weaker it remains a spoiler of peace in Somalia and a major challenge both to the Federal Government of Somalia and other international actors involved in the state’s reconstruction. Al-shabaab still opposes any internationally supported initiative of rebuilding the state in Somalia and the presence of foreign forces in Somalia. Its aim to implement an Islamic state lost legitimacy when sharia was recognized as the prevailing law on election of the President Sheikh Sharif Ahmed back in 2009. Article 2 (2) and (3) the Provisional Constitution sets out that Islam and Sharia are recognized as the only religion that can be propagated in Somalia and sharia is the primordial law against which all law should be made compliant (Federal Republic of Somalia, 2012). 53An analysis of the State’s trajectory and of the lines of cleavage in Somalia’s society confirms that the clan and sub-clan cleavages are not the central factor of the crisis of state formation in Somalia. Indeed, clan identities have become increasingly politicized and expressed through forceful means. The politicization of identities was part-and-parcel of the process of state formation, which became more prominent during Siyad Barre’s regime. The competition and conflict over the control of critical resources has predominantly been expressed as a question of rivalry between clans (Brons, 2001: 89-90). In contrast, the analysis shows that the competition over critical resources more often than not has surpassed both clan and religious solidarity. 54The post-transition institutional architecture is an ongoing process at the time of writing already fraught with internal contradictions and lack of previous clarification. A case in point is the gap in the Provisional Constitution and the tension with regard the process of creating and recognizing Federal Member States. Somaliland unilaterally declared independence. However, in the post-transition the Federal Government of Somalia has not shown any signs of its openness to recognizing Somaliland ‘s claim to self-determination. The tension between the capital and the regional centres of power remains a key fault line in the process of rebuilding the state. Finally, the Jubaland initiative and its uncertain outcome at the time of writing highlight the importance of bearing in mind, not only the relations between the capital and Somalia’s regions, but also the positioning of neighbouring states and the degree of influence they are able to exert on Somalia’s political actors. 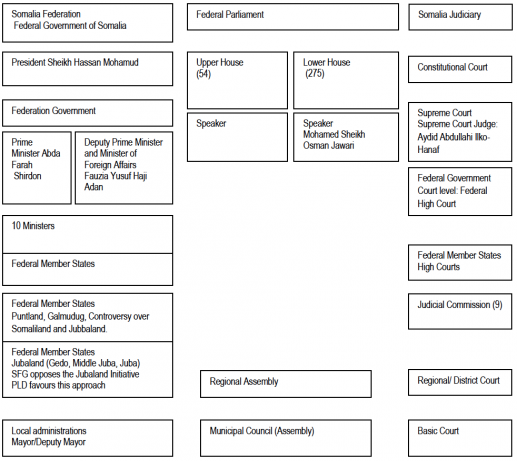 55Somalia’s neighbouring states have recurrently interfered in Somalia’s internal affairs. During the period under analysis this interference has escalated up to the level of intervention and more systematic engagement with the various domestic parties to the conflict. Somalia’s crisis remains pivotal for the region’s security and the security of the contiguous neighbouring states. However, neighbouring states’ interference and intervention in Somalia’s internal affairs are driven by self-interested motivations that at critical moments have militated against the ultimate aim of restoring order and rebuilding the state in Somalia through a domestically led process. The rise and fall of the ICU, even if a 6-month rule period was insufficient to determine its long-term political project for rebuilding the state, was a domestic generated project, but its fall was precipitated by a combination of regional and global dynamics. In this regard, both Ethiopia’s and the US’s foreign policies vis-à-vis Somalia coincided in the determination to prevent a militant Islamist movement (even if domestically generated and with extended support from domestic constituencies) from overthrowing an externally created government, the Transitional Federal Government at the time led by President Yussuf. 56Although Somalia´s crisis of state formation requires a regionalist approach to the restoration of order both within Somalia and in the region, the process of rebuilding the state will necessarily reflect local priorities and local mechanisms of conflict resolution, reconciliation and reparation. This is the only lesson learned from several international conferences that have failed in their ultimate aim of contributing to the reconstruction of the state. Bali, S. (2005), “Migration and Refugees”, in B. White, R. Little and Michael Smith (eds. ), Issues in World Politics, Hampshire & New York, Palgrave Macmillan, pp.173-193. Barnes, C., and Harun Hassan (2007, April), The Rise and Fall of Mogadishu’s Islamic Courts, London, Chatham House [available at: http://www.chathamhouse.org.uk, accessed 7 May 2013]. BBC News Africa (2013, 14 April), “Somalia conflict: ‘Foreigners’ behind Mogadishu attacks” [available at: http://www.bbc.co.uk/news/world-africa-22153911, accessed 7 May 2013]. Bose, S. (2002), Bosnia after Dayton: Nationalist Partition and International Intervention, London, Hurst & Company. Bradbury, M. (2009), The Search for Peace: A Synthesis Report of the Peace Mapping Study, Nairobi, Interpeace and the Academy for Peace and Development, the Center for Research and Dialogue, and the Puntland Development Research Center [available at: http://www.interpeace.org/2011-08-08-15-19-20/latest-news/423-peace-mapping-study, accessed 7 May 2013]. Brons, M. H. (2001), Society, Security, Sovereignty and the State in Somalia: From Statelessness to Statelessness?, Utrecht, International Books. Bull, H., and Carsten Holbraad (eds.) (1995), Power politics/Martin Wight , New York, Leicester University Press. Cassanelli, L. (2003), “Explaining the Somali Crisis”, in C. Besteman and Lee Cassanelli (eds. ), The Struggle for Land in Southern Somalia: The War Behind the War, London, Westview Press & Haan Publishing, pp. 13-26. Clapham, C. (2011), “Africa and Trusteeship in the Modern Global Order”, in J. Mayall and Ricardo Soares Oliveira (eds. ), The New Protectorates: International Tutelage and the Making of Liberal States, London, C. Hurst & Co., pp. 67-82. Cliffe, L. (1999), “Regional Dimensions of conflict in the Horn of Africa”, Third World Quarterly, 20 (1), pp. 89-111. Compagnon, D. (1998), “Somali Armed Movements: The Interplay of Political Entrepreneurship & Clan- Based Factions”, in C. Clapham (ed. ), African Guerrillas, Fountain & Indiana, James Currey, pp. 73-90. Elmi, A. A. (2010), Understanding the Somalia Conflagration: Identity, Political Islam and Peacebuilding, London & New York, Pluto Press. Federal Republic of Somalia (2012), Provisional Constitution [available at: http://unpos.unmissions.org/, accessed 7 May 2013]. Flood, D. H. (2011), “The Jubaland Initiative: Is Kenya Creating a Buffer State in Southern Somalia?”, Terrorism Monitor, 9 (17) [available at: http://www.jamestown.org/single/?no_cache=1&tx_ttnews%5Btt_news%5D=37857, accessed 7 May 2013]. Hagmann, T. (2005), “Review Article: From state collapse to duty-free: Somalia's path to Modernity”, African Affairs, 104 (416), pp. 525-535. Hammerstad, A. (2010), “Population movement and its impact on world politics”, in M. Beeson and N. Bisley (eds. ), Issues in 21st century world politics, London, Palgrave Macmillan, pp. 238-250. Helander, B. (1999), “Somalia”, in D. Westerlund and Ingvar Svanberg (eds. ), Islam outside the Arab world, Curzon ; New York, St. Martin’s Press, pp. 37-55. Human Rights Watch (2007, 5 April), Somalia: End Indiscriminate Attacks in Mogadishu/ Armed Groups Should Protect Civilians, Ensure Access to Aid, [available at: http://hrw.org/english/docs/2007/04/05/somali15666.htm, accessed 7 May 2013]. Human Rights Watch (2008, 12 June), Collective Punishment: War Crimes and Crimes against Humanity in the Ogaden area of Ethiopia’s Somali Region [available at: http://www.hrw.org/world-report/2013/publications/62176, accessed 7 May 2013]. cover.pdf, accessed 7 May 2013]. Human Rights Watch (2013, 28 March), Hostages of the Gatekeepers: Abuses against Internally Displaced in Mogadishu, Somalia [available at: http://www.hrw.org/world-report/2013/publications/114366, accessed 7 May 2013]. ICG [International Crisis Group] (2005, 12 December), “Somalia’s Islamists”, Africa Report, 100, Nairobi & Brussels, Crisis Group. ICG [International Crisis Group] (2012, 15 February), “The Kenyan Military Intervention in Somalia”, Africa Report, 184, Nairobi & Brussels, Crisis Group. IRIN (2013, 16 April), “Briefing: Somalia, federalism and Jubaland” [available at: http://www.irinnews.org/Report/97860/Briefing-Somalia-federalism-and-Jubaland, accessed 7 May 2013]. Jacquin-Berdal, D. (2002), Nationalism and Ethnicity in the Horn of Africa: A Critique of the Ethnic Interpretation, Lewiston, Queenston, Lampeter, Edwin Mellen Press. Kapteijns, L. (2001), “The Disintegration of Somalia: A Historiographical Essay”, Bildhaan: An International Journal of Somali Studies, 1, pp. 11-52 [available at: http://digitalcommons.macalester.edu/bildhaan/vol11/iss11/16, accessed 7 May 2013]. Lewis, I. M. (1989), “The Ogaden and the Fragility of Somali Segmentary Nationalism”, African Affairs, 88 (353), pp. 573-579. Lewis, I. M. (2002), A modern history of the Somali: nation and state in the Horn of Africa, Oxford, James Currey. Lewis, I., and James Mayall (1996), “Somalia”, in J. Mayall (ed. ), The New Interventionism 1991- 1994: United Nations experience in Cambodia, former Yugoslavia and Somalia, Cambridge, Cambridge University Press, pp. 94-124. Little, P. D. (2003), Somalia : economy without state, Oxford, James Currey. Lomo, Z. (2006), ‘’Refugees in East Africa: Developing an Integrated Approach’’, in D.A. Bekoe (ed. ), East Africa and the Horn: Confronting Challenges to Good Governance, Colorado and London, Lynne Rienner Publishers, pp. 37-57. Marchal, R. (2009), “A tentative assessment of the Somali Harakat Al-Shabaab”, Journal of Eastern African Studies, 3 (3), pp. 381 – 404. Marchal, R. (2012), The mercy of neighbours: security and governance in a new Somalia, NOREF. Mayall, J. (1978), “The battle for the Horn: Somali Irredentism and international diplomacy”, World Today, 34 (9), pp. 336-345. McSweeney , D. (2012), “Conflict and deteriorating security in Dadaab”, Humanitarian Exchange Magazine, 53 [available at: http://www.odihpn.org/humanitarian-exchange-magazine/issue-53/conflict-and-deteriorating-security-in-dadaab, accessed 7 May 2013]. Menkhaus, K. (2003), “From Feast to Famine: Land and the State in Somalia's Lower Jubba Valley”, in C. Besteman and Lee Cassanelli (eds. ), The Struggle for Land in Southern Somalia: The War Behind the War, London, Westview Press & Haan Publishing, pp.133-153. Menkhaus, K. (2004), Somalia: State Collapse and the Threat of Terrorism, Adelphi Paper 364 , Oxford, Oxford University Press for IISS. Menkhaus, K. (2007), “The Crisis in Somalia: Tragedy in Five Acts”, African Affairs, 106 (204), pp. 357-390. Menkhaus, K. (2008), “Arrangements sécuritaires locaux dans les régions somalies de la Corne de l’Afrique”, Politique Africaine, 111, pp. 22-43. 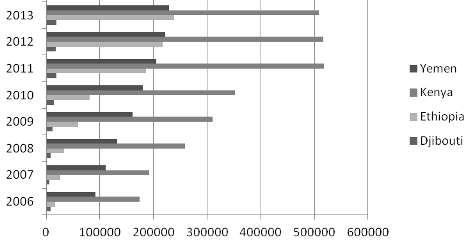 Opérations Paix Net (2013, 10 April), “AMISOM Troop Contributing Countries” [available at: http://www.operationspaix.net/1-operation-amisom.html, accessed 7 May 2013]. Roberts, K. (2007, 26 March), “U.S. moves Kenya terror suspect to Guantanamo”, Reuters [available at: http://www.reuters.com/article/2007/03/26/us-guantanamo-suspect-idUSN2639120220070326, accessed 7 May 2013]. Samatar, A.I. (1997), “Leadership and ethnicity in the making of African state models: Botswana versus Somalia”, Third World Quarterly, 18(4), pp. 687-707. Samatar, A.I. (2006), “Briefings: The Miracle of Mogadishu”, Review of African Political Economy, 109, pp. 581-587. Sudan Tribune (2007, 23 April), “Eritrea suspends its membership in IGAD over Somalia” [available at: http://www.sudantribune.com/spip.php?article21508, accessed 7 May 2013]. Sudan Tribune (2011, 30 July), “Eritrea demands formally to rejoin IGAD” [available at: http://www.sudantribune.com/Eritrea-demands-formally-to-rejoin,39687, accessed 7 May 2013]. UNHCR (2006), 2006 UNHCR Statistical Yearbook: Somalia, UNHCR, pp. 324-325 [available at: http://www.unhcr.org/478cda572.html, accessed 7 May 2013]. UNHCR (2007), 2007 UNHCR Statistical Yearbook: Statistical Annexes Somalia, UNHCR, pp. 78 [available at: http://www.unhcr.org/4981b4919d4982.html, accessed 7 May 2013]. UNHCR (2008), 2008 UNHCR Statistical Yearbook: Somalia, UNHCR, pp. 86 [available at: http://www.unhcr.org/84bcc85c89f89.html, accessed 7 May 2013]. UNHCR (2009), 2009 UNHCR Statistical Yearbook: Trends in Displacement, Protection and Solution (Statistical Annexes Somalia), UNHCR, pp. 78 [available at: http://www.unhcr.org/74ce5327f5329.html, accessed 7 May 2013]. UNHCR (2010), 2010 UNHCR Statistical Yearbook: Trends in Displacement, Protection and Solutions : Ten Years of Statistics (Statistical Annexes Somalia), UNHCR, pp. 80 [available at: http://www.unhcr.org/84ef89c7269.html, accessed 7 May 2013]. UNHCR (2011), 2011 UNHCR Statistical Yearbook: Trends in Displacement, Protection and Solutions : Eleven Years of Statistics (Statistical Annexes Somalia), UNHCR, pp. 79 [available at: http://www.unhcr.org/516282cf5.html, accessed 7 May 2013]. UNHCR (2012), Somalia Fact Sheet November 2012, UNHCR, pp. 1-2 [available at: http://data.unhcr.org/horn-of-africa/documents.php?page=1&view=grid&Country%5B%5D=197, accessed 7 May 2013]. UNHCR (2013), Somalia Briefing Sheet (Fact Sheet) April 2013, UNHCR, pp. 1-2 [available at: http://data.unhcr.org/horn-of-africa/country.php?id=197, accessed 7 May 2013]. UNSC [United Nations Security Council] (1992, 3 December), UNSC Resolution 794 [available at: http://www.securitycouncilreport.org/atf/cf/%7B65BFCF9B-6D27-4E9C-8CD3-CF6E4FF96FF9%7D/Chap%20VII%20SRES%20794.pdf, accessed 7 May 2013]. UNSC [United Nations Security Council] (2007, 20 February), UNSC Resolution 1744 [available at: http://www.securitycouncilreport.org/atf/cf/%7B65BFCF9B-6D27-4E9C-8CD3-CF6E4FF96FF9%7D/Somalia%20S%20RES%201744.pdf, accessed 7 May 2013]. UNSC [United Nations Security Council] (2013a, 6 March), UNSC Resolution 2093 [available at: http://www.securitycouncilreport.org/atf/cf/%7B65BFCF9B-6D27-4E9C-8CD3-CF6E4FF96FF9%7D/s_res_2093.pdf, accessed 7 May 2013]. UNSC [United Nations Security Council] (2013b, 2 May), UNSC Resolution 2102 [available at: http://www.securitycouncilreport.org/atf/cf/%7B65BFCF9B-6D27-4E9C-8CD3-CF6E4FF96FF9%7D/s_res_2102.pdf, accessed 7 May 2013]. Vines, A. (2012), Stability and Development in Somalia, London, Chatham House [available at: http://www.chathamhouse.org/publications/papers/view/187329, accessed 7 May 2013]. Woodward, P. (1996), The Horn of Africa: state politics and international relations, London, I. B. Tauris. Woodward, P. (2013), Crisis in the Horn of Africa: Politics, Piracy and the Threat of Terror, London & New York, I.B. Tauris. 1 Jubaland comprises the following regions: Lower Juba, Middle Juba and Gedo. These regions are contiguous to Kenya and Ethiopia. Jubaland would cover a combined area of 87,000 km2 and have a total population of around 1.3 million. Numerous clans live in these regions, such as the Ogaden-Darood, Marehan-Darood, Sheekhaal, Coormale, Biimaal, Gaaljecel, Rahanweyn , Dir, Gawaaweyn, Murile, Bejuni Boni and various Bantu groups. 2 On 25 April 2013, the Union Jack was raised for the first time in Mogadishu since the UK’s embassy closure in 1991. British Foreign Secretary William Hague was in Mogadishu for the formal opening of the Embassy. 3 On 14 April 2013, al-shabaab successfully disrupted a court session in the capital with a bomb attack and several people were injured and 29 reportedly killed. This was the most successful al-shabaab attack since the insurgents had been expelled from the capital in August 2011. Alexandra M. Dias is an Auxiliary Researcher at the Centre for African Studies and Invited Auxiliary Professor at the ISCTE-IUL Department of History. She completed her master's degree in African Studies at ISCTE and she obtained her PhD at the Department of International Relations of the London School of Economics and Political Science. Her PhD entitled “An inter-state war in the post-Cold War era: 1998-2000 war between Eritrea and Ethiopia” received an honourable mention in the second Selecting Committee of the Portuguese Political Science Association’s (APCP) Prize for Best PhD Thesis. DIAS, Alexandra Magnólia. International intervention and engagement in Somalia (2006-2013): yet another external state reconstruction project? 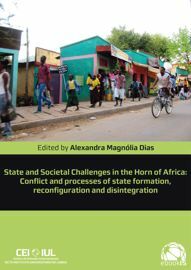 In : State and Societal Challenges in the Horn of Africa : Conflict and processes of state formation, reconfiguration and disintegration [en ligne]. Lisboa : Centro de Estudos Internacionais, 2013 (généré le 19 avril 2019). Disponible sur Internet : <http://books.openedition.org/cei/276>. ISBN : 9789898862471. Dias, Alexandra Magnólia. “International intervention and engagement in Somalia (2006-2013): yet another external state reconstruction project?”. Magnólia Dias, Alexandra. State and Societal Challenges in the Horn of Africa : Conflict and processes of state formation, reconfiguration and disintegration. Lisboa : Centro de Estudos Internacionais, 2013. (pp. 90-107) Web. <http://books.openedition.org/cei/276>. MAGNÓLIA DIAS, Alexandra (dir.). State and Societal Challenges in the Horn of Africa : Conflict and processes of state formation, reconfiguration and disintegration. Nouvelle édition [en ligne]. Lisboa : Centro de Estudos Internacionais, 2013 (généré le 19 avril 2019). Disponible sur Internet : <http://books.openedition.org/cei/242>. ISBN : 9789898862471. Magnólia Dias, Alexandra, ed. State and Societal Challenges in the Horn of Africa : Conflict and processes of state formation, reconfiguration and disintegration. Lisboa : Centro de Estudos Internacionais, 2013. Web. <http://books.openedition.org/cei/242>.